The 90 square meter apartment for 6 people is equipped with a living room (upholstered furniture, flat-screen TV, radio, dining table, stove), three separate bedrooms (1 x double bed, 2 x 2 single beds), a kitchen (electric stove with oven, Refrigerator with freezer, dishwasher, div. Kitchen appliances), shower / WC and central heating. The two apartments of different sizes are located completely separate on the ground floor of a holiday house on the farmyard of the local farmer. An area of ​​approx. 1000 sqm has been defined for holiday guests. The apartments were modernized in 2016 and furnished to a high standard. 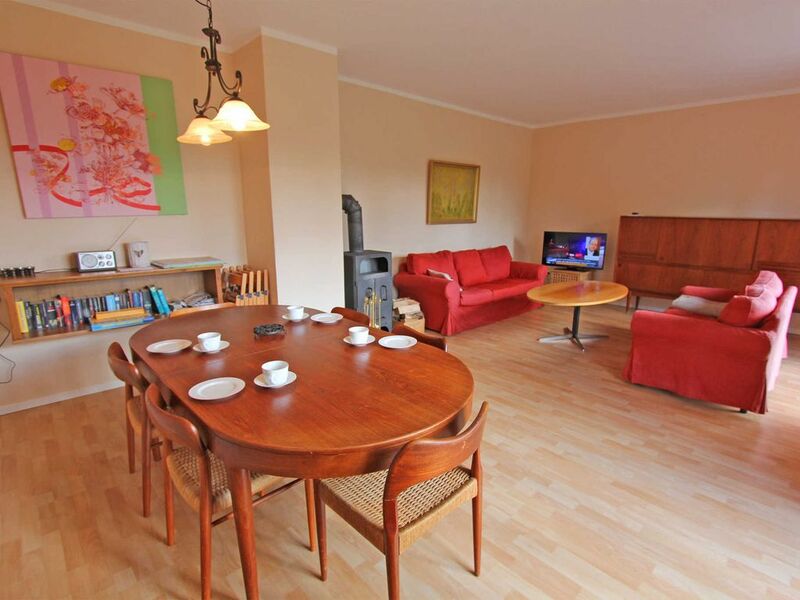 Outside there is a furnished terrace, sunbathing area, barbecue, bicycle storage and parking. There is also free Wi-Fi. For infants, a cot and high chair can be provided. The total price includes bed linen, towels, water and energy consumption as well as final cleaning. Pets: Pets are allowed on request (5 EUR / pers.). The pets must be registered with the booking. If an entry note is not possible, a late registration must be made. Die Leute sehr freundlich! Super Haus! Besonders für Hundebesitzer geeignet. Roggentin is a part of the resort Mirow (12 km) on the edge of the Müritz National Park. The environment is very rural. Wide fields, meadows, forests and horse-pairs dominate the landscape. In about 5 km there are several bathing lakes. Peaceful nature lovers will find perfect conditions here. Mirow is a small town in the middle of the Mecklenburg Lake District between Neustrelitz (about 25 km away) and the health resort Waren / Müritz (about 45 km away). The biggest attraction of the city is the castle island with the castle Mirow reopened only in June 2014 after many years of restoration. The castle is the backdrop for events. There are also guided tours or markets. The city is situated on the Müritz-Havel-Wasserstraße and the lake Mirower in the village is connected to the Müritz via several waters, which is why Mirow is a favorite place for water sportsmen and hikers. Also worth seeing are the Johanniterkirche and the idyllic Liebesinsel. In town there are several restaurants, shopping and cafes, boat and bicycle rental.